The Woodrow Wilson Presidential Library and Museum welcomes visitors who may need accomadations. For the best experience possible at the Library & Museum, we have provided information below to help you plan your visit. Please let us know if you have any further questions or comments by calling us at (540) 885-0897. Handicapped parking is not located in the general parking lot, but is conveniently located off of Coalter Street between the gray and the brick building (Museum and Smith House). When turning into the light colored brick driveway, handicapped parking is to the immediate right. A second handicapped parking spot is a short distance down the same driveway on the left. The area where the Museum is located is on one level, but is located in a historic district that features brick sidewalks that are uneven. There is a fair amount of standing and walking. There are benches and chairs to serve as rest areas as you visit the campus. If stairs and hills are a problem, please consider street parking in the neighborhood across from our site. 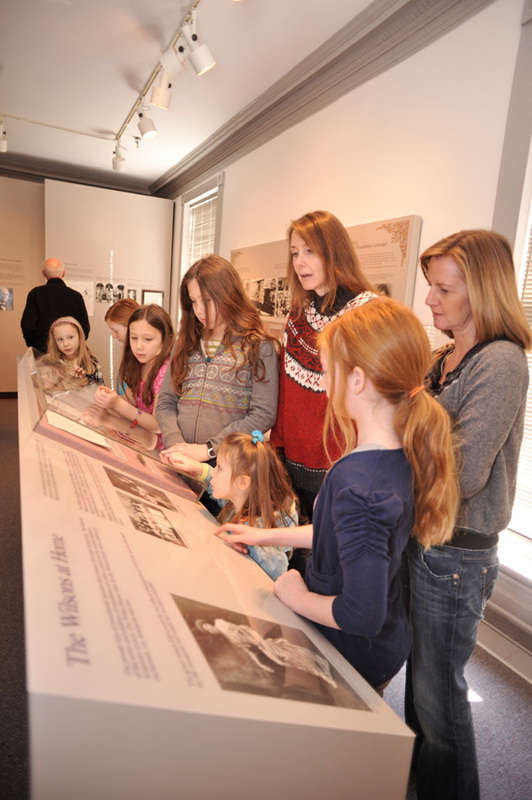 The Woodrow Wilson Museum includes exhibit galleries which are easily accessible on the first floor. The World War I trench exhibit located on the ground floor is not accessible, but visitors may view a filmed tour of the trench exhibit while in the Museum. The birthplace Manse is accessible on both the first and lower floors. As it is an historic structure, we are unable to allow motorized scooters in the Manse. A wheelchair is available for those who are unable to walk around the Museum or the Manse. Printed Manse and film scripts are available to those with hearing difficulties. The Woodrow Wilson Presidential Library abides by the Americans with Disabilities Act (ADA), and allows service animals, that is, animals trained to perform specific tasks for an individual with a disability, into all the public areas of the Museum. Staff may only ask two questions of the animal’s owner if his or her disability is not obvious: 1) Is the animal a service animal required because of a disability? and 2) What work or task has the animal been trained to perform? The staff is not allowed to ask about the specifics of the owner's disability or request any documentation or proof of either the owner’s disability or animal’s abilities. A service animal is required to be under control at all times by its handler. An out of control or disruptive animal may be required to leave the Museum if the handler is unable to reestablish control over the animal or stop the disruptive behavior. Out of control behaviors include consistent barking, lunging or being aggressive towards people, interfering with collections objects, or urinating or defecating on the premises. If the animal’s behavior warrants its removal from the Museum, the animal’s handler can stay in the Museum without the animal. The Woodrow Wilson Presidential Library abides by the ADA regarding the accessibility of service animals because they perform a specific job. However, animals such as “comfort animals”, “therapy animals”, “companion animals,” or “emotional support animals” are not service animals as defined by the ADA because they are not trained to perform a specific task for an individual with a disability and are therefore not allowed into the Museum.